This rubber stamp set contains 11 images including a howling wolf, a carriage, trees, ironwork some grunge style splodges. Not just for Halloween, there are plenty of other occasions where these stamps would be really useful. Beautiful images which stamp really well. Obviously useful for Gothic and Halloween cards but can be adapted into many other things (I'm thinking Christmas cards with the owl and branches, and prairie scenes with the wolf!). A gorgeous stamp set which produces perfect images every time. I fell for the cat on the pumpkin carriage, but all the images are going to be useful. Amazingly prompt delivery; couldn't believe it when the envelope landed on my mat! This is the first lot of choc baroque stamps i have purchased...won't be the last! As a lover of all things Gothic, these stamps were right up my street. You can make stunning cards with very few materials as the silhouettes are so striking...and not just for Halloween. 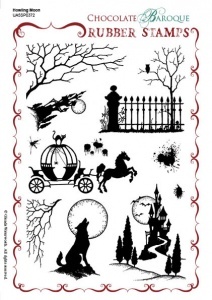 I love the images on this sheet, and Halloween/spooky/gothic stamps are something I am really short of, so finding this on special offer was great. I especially love the howling wolf stamp. Fabulous images, quality and the super fast delivery is exceptional, Thanks. Love this stamp set and I won't use it for only halloween. Fab for gothic cards and for teenagers too. Quick delivery. As usual superbly made stamps and fantastic images. First set of Halloween Stamps I have ever bought but these can be used for more than just Halloween. Anything for Goths etc. Love these stamps, they tell a story of mystery and fantasy.